Payment Instructions: All accounts must be settled the day of pickup and payment. Any accounts not settled the day of payment and pickup will be charged using the credit card on file, unless other arrangements are made by calling Denny O'bryan at 712-261-1316. Pick-up: by appointment at locations listed by item. 2012 Case IH Magnum 290 MFD 19/4 Powershift Transmission Only 45 Hours!!! 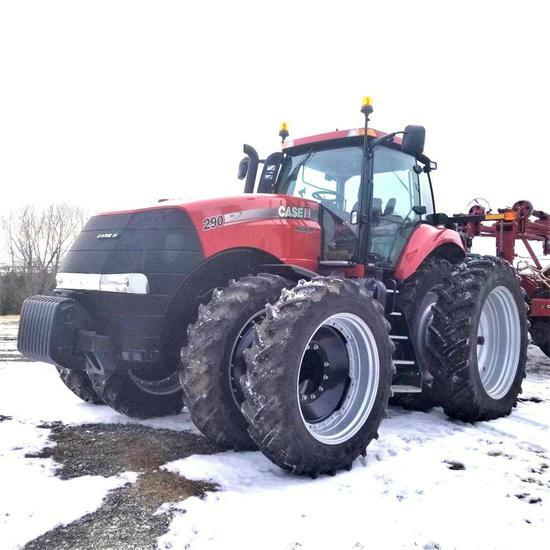 2012 Case IH Magnum 290, MFD, 19/4 Full Powershift LH Shuttle Transmission, 540-1000 Pto, 4 Remotes, Electronic Joystick, Power Beyond/Return, High Capacity Pump, Cat III Drawbar/Hammerstrap, 3 Point w/ Quick Hitch, Luxury Leather Interior, Leather PosiResponse Seat, Buddy Seat, Performance Monitor, Electric Mirrors, Beacon Lights, Electric Armrest Adjust, RH Display Ready, Auto Track / ISO Ready, MFD Fenders, 1000lb Front Weight, 2000lb Rear Weight, 380x80x38 Front Drivers and Duals, 480/80X50 Rear Drivers and Duals, MIchelin Agribib, Sn ZBRD07238 ONLY 45 HOURS Owner Marla Conley 712-229-0821 Aucton Contact Denny OBryan 712-261-1316 Location Cherokee Call for Viewing Appointment YES ONLY 45 HOURS !!!!! 2008 Case IH Magnum 215 MFD Powershift Tractor 886 Hours !! !